Roast pork, like Roast Beef, is an intrinsic part of a Sunday Roast - though there is no need to keep it just for that meal. A perfect roast pork should have lovely moist, evenly cooked meat surrounded by crisp, sharp crackling. The crackling can be either left on or removed at the end of cooking and served separately. If you buy a large joint of pork, don't worry, adjust the cooking times to suit the size (see below). Plus, you can never have too much leftover pork to make delicious sandwiches for lunch the next day. Preheat the oven to 425 F/220 C/gas 7. The pork should be at room temperature before you start this recipe, so remove the loin from the fridge a few hours before needed. Using a paper towel dry the pork all over including the skin. Using a very sharp knife make slashes approx a finger width apart across the skin, don't cut through to the meat; you can always ask your butcher to do this for you. Massage the olive oil into the skin, followed by the salt flakes making sure it goes down into the slashes. Place the pork into a large roasting tin. Tuck the two onion halves under the meat, and cook for 1 hour and 40 minutes. If you are using a larger or smaller joint, then cook for 25 minutes per 1 pound, plus a further 25 minutes. Switch off the oven (unless you need to cook the crackling further, see note below). Remove the meat from the roasting tin and place onto a serving plate, cover loosely with foil and place in the oven with the door slightly ajar, or if you need the oven for other dishes, wrap the meat entirely in foil and keep in a warm place. Remove the onion from the pan, then place the pan on the stovetop over high heat until the meat juices begin to bubble, but not starting to burn. Add the flour, and stir to blend into the meat juices. Strain the gravy through a fine sieve into a saucepan and reduce by one-third. Add the butter in tiny pieces shaking the pan gently until the all the butter is absorbed. Keep warm until needed. Remove the crackling from the pork. Carve the crackling into thick slices. 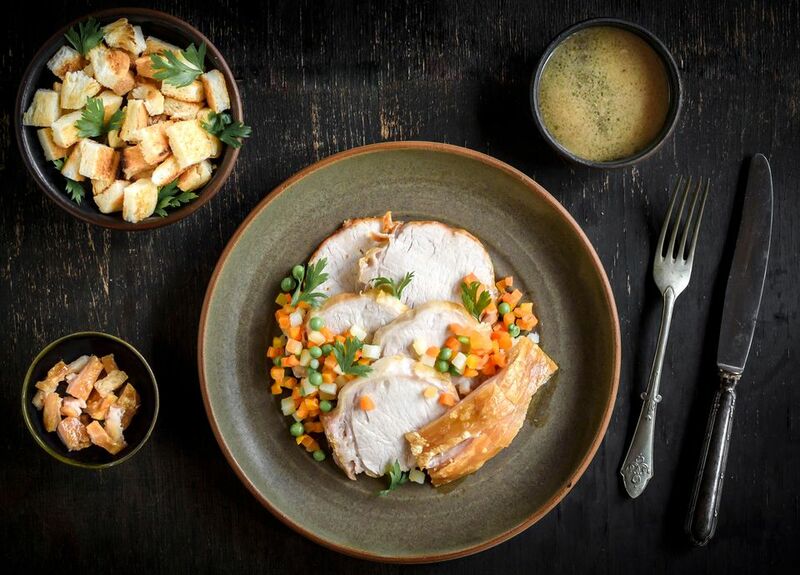 Serve with pieces of crackling and the gravy, seasonal vegetables, applesauce is an excellent accompaniment to pork, as is sage and onion stuffing. Don't forget the traditional Yorkshire Puddings if it is a Sunday lunch. Use outdoor, free-range pork if you can as this will have a good thick layer of fat. A good layer of fat under the skin is needed to keep the meat both moist during cooking and also adds flavor to the finished roast, and as the fat renders down, there's no reason to worry about eating too much. Also, you can always cut any excess fat away before eating. If the pork needs to be stored before cooking, leave it unwrapped in the fridge on a lower shelf. Pork cooks much better when the skin is dry (especially if you want to make crackling) so leaving uncovered helps in this process. At the time of cooking, the pork should be at room temperature, not cold straight from the fridge, so remove for several hours and leave covered in a cool, not warm, place. The formula for cooking this roast is 25 minutes per pound, plus an additional 25 minutes. For example, a 4-pound roast would be: (25 minutes x 4 pounds) + 25 minutes more= 125 minutes. Pork should reach a minimum temperature of 145 F according to the USDA.